Avascular Necrosis (AVN), sometimes referred to as osteonecrosis, ischemic necrosis, bone infarction or aseptic necrosis, is a troubling condition. Basically, avascular necrosis ( AVN) refers to a situation in which the blood supply to a region of bone has been disrupted. This loss of blood supply known as ischemia or avascular, leads to bone cell death (necrosis) as the loss of blood supply results in loss of cellular nutrition which causes cell death of the bone(s). This can result in joint collapse and rapid secondary arthritis. 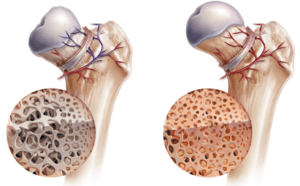 Traditionally, surgery has been viewed as joint replacement when the joint has deteriorated. There is a surgical method of delivering stem cells, though not originally known that it worked by this mechanism, called core decompression. The affected bone that has AVN is drilled deep with holes, this allows bone marrow to seep into the area. It is painful and has a long recovery time. The other problem is that as we age age bone marrow stem cells decline rendering this method less than ideal. A simpler method is to simply extract the stem cells from adipose tissue (fat) and perform a joint injection of stem cells. There is no downtime associated with surgery and the total stem cell count is much higher. As regenerative medicine continues to expand the use of therapies such as Platelet Rich Plasma (PRP) and Stem Cell Therapy will be a viable option for patients with AVN and other musculoskeletal conditions.